What are efficient and effective ways to leverage technology to support teacher learning in STEM education? Find out in this timely volume examining exemplary models of online and blended teacher professional learning. In Chapter 4, staff from WestEd’s Strategic Literacy Initiative describe iRAISE, an online course designed to support high school science teachers increase student comprehension of science texts. 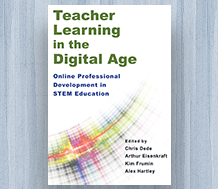 Chapter 12, written by staff from WestEd’s STEM program, discusses five approaches to online professional development. Visit the Teacher Learning in the Digital Age: Online Professional Development in STEM Education resource page to learn more and order a copy.